A 1/4 cup of Quinoa (pronounced Keen-wah) has 172 calories, 2.8 grams of fat, 0 grams of cholesterol, 3 grams of fiber, 3 grams of sugar, and 6 grams of protein. Quinoa is a good source of calcium, iron, phosphorous, vitamin E and several B vitamins, magnesium, manganese, and copper. Quinoa has both soluble Dietary Fiber and In-soluble Dietary Fiber, the percentage is approximately 36% soluble fiber and 64% in-soluble fiber. 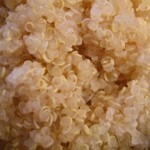 Quinoa is gluten free making it a great choice for those with gluten sensitivities. Quinoa is only 35 on the GI chart making it a great grain for anyone worried about sugar spikes or anyone watching their weight. Quiona is a balanced-amino-acid source of high quality protein. Quinoa is a high-iron food that raises the hematocrit, delivers more oxygen to the brain, fights senility. Quinoa can help those suffering from migraine headaches because it has the mineral magnesium which helps relax blood vessels. Quinoa has the amino acid Lysine in it which is helpful to those suffering from cold sores or herpes of any kind. Lysine suppresses the herpes virus so instead of taking a Lysine pill eat Quinoa instead. 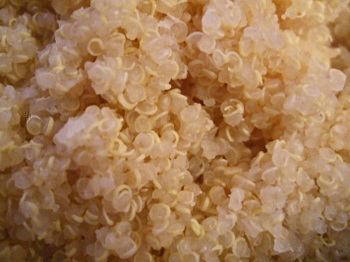 Quinoa is rich in riboflavin which is necessary for energy production. The combination of protein and fiber in Quinoa makes it a very filling food which can aid in weight loss.